Today 95 years ago a committed crew of rebels launched what can only be called the seminal event in Modern Irish History, the 1916 Rising. 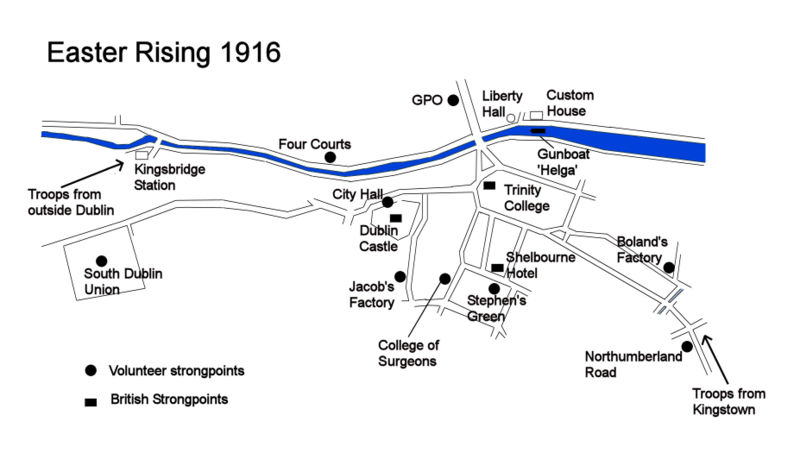 They stormed the General Post Office (GPO), Boland’s Mills and several other strategic locations in Dublin city. They also failed on this first hectic and strange day, either through lack of numbers, poor planning or bad tactics to seize some other vital strong points, most particularly Dublin Castle and Trinity College. Within the week, British Forces had suppressed the rising and brought the city completely under its control. A more in-depth look at the first day of the Rising is here. There are many excellent resources online to learn more about the events of that week but one I can wholeheartedly suggest is, The Irish Story‘s author, John Dorney’s new short book on the subject, The Story Of The Easter Rising, 1916. Written by: Eoinpurcell on 24 April, 2010. Last revised by: John_Dorney2 May, 2011.